Analytics provide direct insight into how your website is performing, how your customers are finding your website, and how customers are learning about your business and products or services. The data equips you with the knowledge to determine what’s working and helps you identify areas where you can make improvements. The benefits of using analytics are endless. It allows you to measure, and thus improve, your ROI of digital efforts, improve the targeting of your marketing efforts, optimize conversions and improve the path to conversions, and identify online revenue-enhancing opportunities, to name a few. Without the use of an analytics platform on your website, you are left having to make decisions about your marketing efforts without being able to see the whole picture. Without analytics, decisions are based on gut instincts, historical spending, testing, brand awareness, survey results, etc. While these tactics are important components to decision making, having a complete picture of the results of your digital efforts is critical for marketing strategies, budgeting, and forecasting. Is my Website Analytics Data Accurate? It is important that when you are using an analytics platform, the data you are collecting is as accurate as possible. There are several ways to ensure that you are collecting the most relevant data in Google Analytics. Internal traffic patterns are typically different from external traffic patterns. When your reporting views contain hit data from both internal and external users of your website, it might become difficult to determine how your customers are interacting with your website. To filter internal traffic, you can set up an IP address filter. Bots and Spiders crawl the web looking for information. Some bots are bad and used for things like email address harvesting, comment spam, and click fraud. Some bots aren’t bad, like the Google bot that is used to create and update Google’s index. Either way, when bots crawl your site they are affecting your site performance and thus should be excluded from your data. Referrer spam is a unique type of spam content that is visible through the web Analytics dashboard. It shows up as either a fake traffic referral, a search term, or a direct visit. This can severely impact up your data. 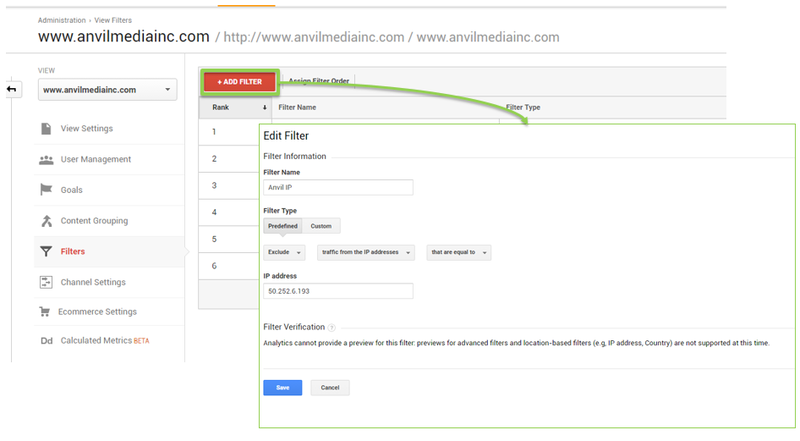 Create a new Filter – A filter will only exclude spam traffic starting from the point when the filter has been set up. A filter will not remove spam traffic from historic data. Create a Custom Segment – To eliminate spam immediately, you can use a Custom Segment. 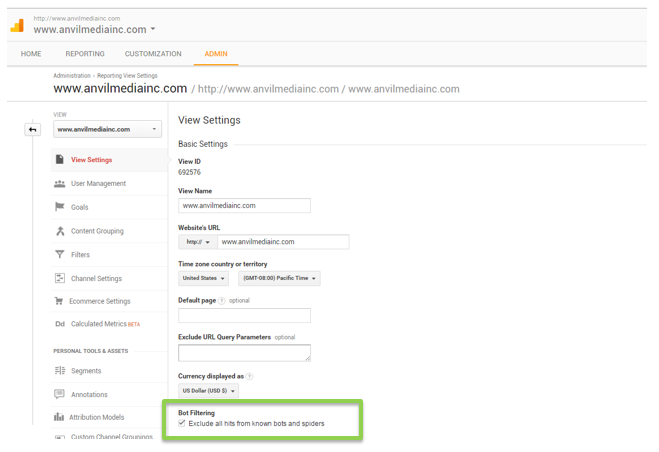 Rather than in the Admin section, the Custom Segment will be set up in the Reporting section of Analytics. For the most up-to-date Spam Crawler Filter Expressions, Analytics Edge provides a guide and the most up-to-date spam filters. 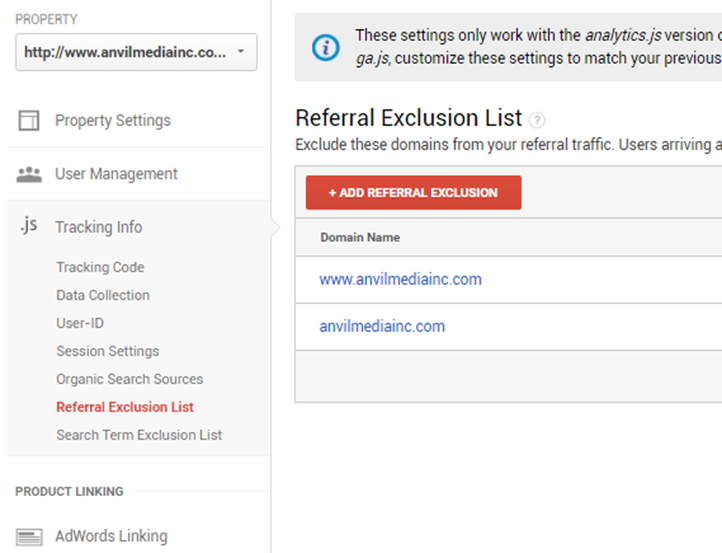 Occasionally, when you are looking at your referrals report for your site, you will see that your own site is showing up as a referral source. There are a couple reasons this might happen. If a visitor opens your site in one tab or window and leaves the page open while doing other things for more than 30 minutes and then later comes back to your site and is active again, this can trigger a self-referral. Cross domain tracking makes it possible for Analytics to see sessions on two related sites as a single session. For example, the main site and a separate shopping cart site, or blog site. This is also referred to as site linking. To set up cross domain tracking you must make a small modification to your Analytics tracking code for your primary domain and for your secondary domain. 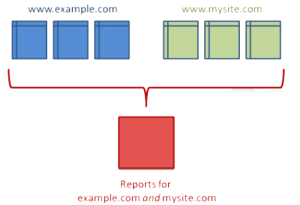 Below are the examples of what the modified tracking code for your primary and secondary domains should look like. The italic text is the standard tracking code provided by Google Analytics and the bold text is the additional code for cross-domain tracking. For more info on cross domain tracking, Google offers Analytics help with a cross-domain tracking help guide. It is vital for businesses to be able to collect and analyze their site data to make informed business decisions. Having the most accurate data as possible will only make your information more powerful for the most informed decisions. If you need help with Google Analytics optimization, contact Anvil, and we will get back to you as soon as possible.